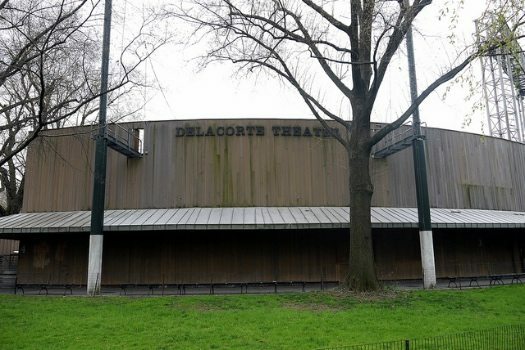 The Delacorte Theatre lost two of its major sponsors for Shakespeare in the Park this year when it staged a production of Julius Caesar that showed the murder of a Trump-like leader. The controversy has built quickly over the past few days, demanding answers to questions about free speech, political art, and donor-grantee relations. Delacorte chose to stage Julius Caesar with a blond, bombastic Caesar in a suit and a Slavic Calpurnia. Critic Jesse Green described the set as “timeless imperial imagery with pointed American allusions.” This would be inflammatory enough for some audiences, but rather than simply displaying the cloak rent by 33 daggers, Marc Antony brandishes the bloody corpse, further offending some viewers. The backlash for this performance has caused both Bank of America and Delta to pull their sponsorships of the production. In a statement, Delta said the production “does not reflect Delta Airlines’ values.” The play’s “artistic and creative direction crossed the line on the standards of good taste,” a spokeswoman wrote. Other viewers took issue with the implied criticism and assassination of President Trump. Art is political, and the tradition of staging Shakespeare’s plays as a form of contemporary political commentary is a long one. Works like Richard III and Henry V were vehicles of political manipulation from the moment the first actor’s feet touched the stage, so while Delacorte Theatre may have gone a bit extreme in representation, the basic premise of their work is not unusual. The question in this situation has to do with their handling of sponsor relationships and any obligations those might entail. Donor-grantee relations are value statements, and it is not legal or advisable to force Delta or Bank of America to support organizations that run contrary to their values. If money is speech (and so says the Supreme Court of the United States), then it must be freely given and freely taken away. This link between sponsorship and values has popped up elsewhere in the sector: when museums faced protests for accepting money from oil companies, when students pressure universities to divest from coal interests, and when Muslim organizations turned down federal funding this year, fearing it would obligate them to cooperate in anti-immigration work. The value tie works both ways. This isn’t to say the production should not be staged, only that Delacorte Theatre needs sponsors that are more informed about and aligned with its values. As Erin Eva Butcher, founder of Maiden Phoenix Theatre Company, pointed out, “It is not the job of art to represent the ‘values’ of a corporation.” But it is the job of nonprofits to be clear about their work and their missions and to find donors who will support that work. Many devoted theatregoers have claimed, in the aftermath of this incident, that they will no longer patronize either Delta or Bank of America. If we support that choice, then we must support the choice of the corporations not to sponsor Delacorte’s production. If anything, Julius Caesar is a cautionary tale to the audience about suspicion, political machination, and the danger of using brute or desperate means to achieve noble ends. Antony, at the end, comments, “All the conspirators, save only [Brutus] did that they did in envy of great Caesar.” The best speech in the play, and one of the most famous in the western theatre canon, is Antony’s funeral oration praising his fallen leader. This isn’t the overthrow of a tyrant, but a preemptive strike in the name of democracy, with terrible consequences. So what message is it that Bank of America and Delta are hesitant to send? Corporate sponsors have been peeling from USAG away one by one, sometimes promising to try to continue to help the athletes outside of the organizational setting and sometimes promising to come back when the organization can prove it is seriously reformed. One excellent idea about how to do that is being floated.